One of the first Linux distributions I ever tried was Slackware, some time before the dinosaurs, circa 1995 - it was quite an adventure, since in those days, nothing worked the first time. Yesterday, I gave the latest Slack a spin and it felt like donning an old frumpy jersey - for that comfy, warm, lived in feeling and nowadays, everything 'Just Works', TM. In short, everything works totally Olde Skool, the way the Fates intended and Slack is Fast. Slackware is the ultimate Long Term Support Linux, since for the better part of the past quarter century, it has been the same. I haven't realized how much the other bloated and slow Linux systems were annoying me all the time and I think that from now, on, I'll be a Slacker again. If you have no idea what you are doing, then maybe Slack isn't for you yet. Rather go and experiment with PCLinuxOS, Fedora or Suse Linux for a bit, then come back later. Slack doesn't have training wheels. The Slackware installer is not unfriendly. It simply assumes that you know what you are doing and basically just gets on with it. Installing Slack takes only a few minutes (or a few weeks/months/years, if you are new!). 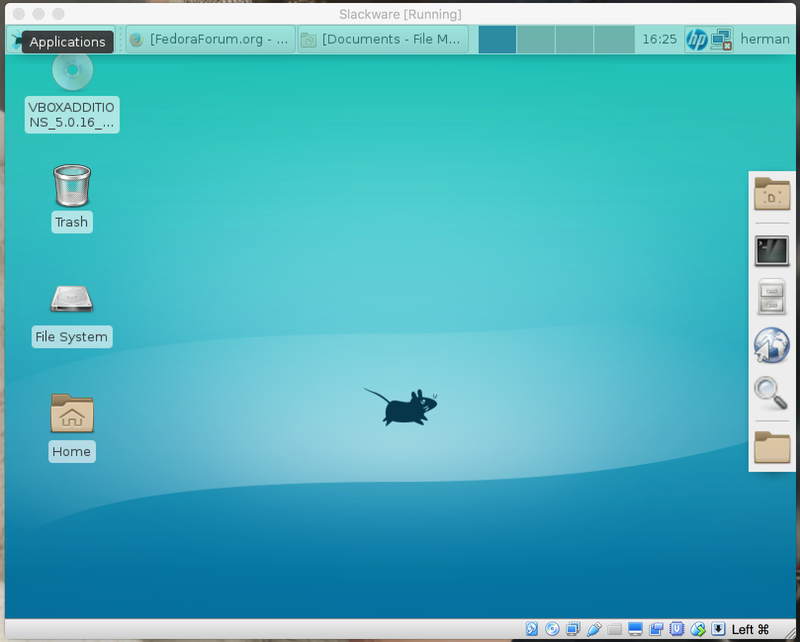 I then made a Virtualbox VM with name Slackware and OS type Linux 2.6 / 3.x (64 bit) with 1 GB RAM and VDI disk size 20 GB. Under Storage, Controller: IDE CDROM, I selected the downloaded ISO file and started her up. An interesting observation is that Slackware is much faster than other Linux versions. Slack with KDE runs fine in a virtual machine, while with most any other distro, one should stick to XFCE to get non-frustrating speed in a VM. Pat's keep it simple and don't fix it if it ain't broke principles, really pay a dividend. So run fdisk /dev/sda, type o to create a MBR DOS partition, type n to make a new partition for +18 GB and again, for 2 GB, type t to change the 2 GB partition to 82 (Linux Swap), type a to make the 2nd partition bootable and type w to write it to disk. Easy as borscht! Deviate from the above, and LILO won't install. You may be able to get it going in Expert mode, but good luck with that. Now run setup and accept all the defaults, the way Pat intended, so that you have a full system with compiler and source code, about 9 GB. Eventually, set the hostname and domainname. The setup program is so simple, that there isn't any point in trying to describe it. Log out and log in as the new user, then run startx to get your graphical desktop. I chose XFCE, but KDE works fine in a VM too - you can change with xwmconfig. It will be a bit sluggish until you install Guest Additions below. Select Mount Guest Additions CD Image from the Virtualbox Devices menu, open it with a file manager and note the path. Open a terminal, su - to root, cd to /run/media/username/VBOX... and run the VboxLinuxAdditions.run file. The system will build itself and install the faster Virtualbox aware mouse and video handlers. That is all there is to it. You are now an official Slacker. The default Slackware system works and does most anything, but after a few days, you may start to look around for a missing tool or ten. Slackbuilds is the answer and sbopkg is the aspirin for the resultant head-ache. Otherwise, if you are extremely lazy and want a Slackware desktop system that is screaming fast and 'Just Works', install Absolute Linux, referenced down below. The forum is hilarious. There can be multiple years between questions and answers, since Slackware changes so slowly. Slackware is interesting in that it has a very simple package management system that doesn't seem to care about dependencies. Usually, it just works. The package managers of other systems will sometimes try to pull in (or remove!) a whole desktop system when you want to install/remove a simple program. Slackware sidesteps this hassle. Once in a blue moon however, you may find a broken package and then need to figure out what the dependencies are to install a missing library.